Custom brand your unique promotional giveaway and engage your audience with our promotional a4 size silver foil envelopes (silver both sides) or one of our other logo printed promo mail out envelopes products. Custom brand your unique promotional giveaway and engage your audience with our promotional silver foil envelopes - semi translucent a4 or one of our other logo printed promo mail out envelopes products. Custom size and custom printed semi transparent silver foil envelopes in your own design are great for mailouts that stand out! Our promotional semi transparent silver foil envelopes are designed to easily hold your mailer and help make your corporate mail-out campaign stand out from the rest. Promotional semi transparent silver foil envelopes make ideal corporate promotional envelopes as they add value to your catalogue or mailout and help make it stand out in the mail. 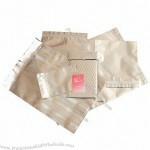 Promotional foil envelopes are great packaging items for all occasions. Our popular foil envelopes are ideal for stand out mailout campaigns and brochures and are also used for packing merchandise. Prices shown is based on A4 size and is based on single colour print on one side only. Extra colour print adds to cost, please check. We can also custom size these envelopes - cost will vary depending on size and print. Great quality promotional foil envelopes are durable and stylish, making them ideal for your next mailout campaign. Our promotional stock silver foil envelopes are designed to easily hold your mailer and help make your corporate mail-out campaign stand out from the rest. Promotional stock silver foil envelopes make ideal corporate promotional envelopes as they add value to your catalogue or mailout and help make it stand out in the mail. 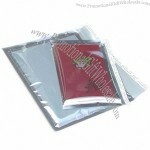 Promotional foil packs are great packaging items for all occasions. Our popular foil envelopes are ideal for stand out mailout campaigns and brochures and are also used for packing merchandise. Our silver foil envelopes are ideal for promotional mail-out campaigns. We have a variety of sizes available to suit any sized mail out. POSTCARD SIZE: internal 170x120mm, external 200x135mm. DL SIZE: internal 250x130mm, external 280x140mm. SQUARE SIZE: internal 210x210mm, external 248x220mm. A5 SIZE: internal 190x260mm, external 200x300mm. A5 SIZE BLACK: internal 190x265mm, external 275x200mm (black on both external sides and silver foil on the inside, with sticky seal). A4 SIZE (Clear/Silver): internal 240x340mm, external 250x375mm. A4 SIZE (Silver Both Sides): internal 240x340mm, external 250x375mm.